Arriving Australia September 2018 – Hepco & Becker motorcycle accessories for the 2018 KTM 790 Duke! H&B’s designers color matched crash protection and given the high RHS exhaust, single sided (left) C-Bow mounted luggage. Add Mini Racks, Tank Ting, a range of Tank & Seat Bags & more. Sport Touring ready! In Stock now! Hepco & Becker motorcycle accessories for Ducatis Scrambler 1100 Special / Sport (mostly all parts are common across the Scrambler range). Crash protection, Rear Racks, C-Bow luggage mounts with hard or soft luggage options, your ready for sport touring or everyday rides. In Stock now! Hepco & Becker motorcycle accessories revised for the updated 2018 Yamaha 900 Tracer GT. 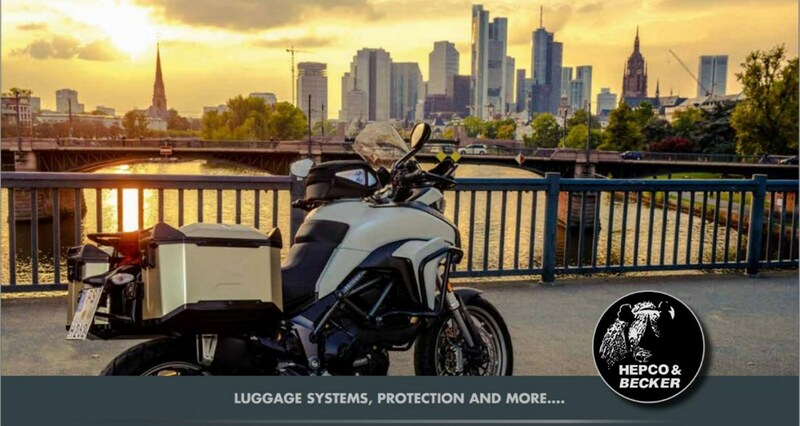 Hard or Soft Luggage cases and mount options, Side Stand Foot, Crash protection, Rear Rack and more, your ready for sport touring. Hepco & Becker motorcycle accessories for Indians Scout Bobber also shared across the Scout & Sixty range. Crash protection, a rugged Cutout Luggage Holder & a range of Leather bags, plus a Solorack and more, ready for those longer runs! In Stock now! Hepco & Becker motorcycle accessories for Kawasaki’s Retro Z900RS or Cafe (mostly all parts are common across this Zed range). Crash protection, Rear Racks, C-Bow luggage mounts with hard or soft luggage options, your ready for sport touring or everyday rides. With the new Bobber, Triumph have created a real hot rod. But even this minimalist design can be setup for longer trips with Hepco & Becker. We offer C-Bow luggage mounts, Crash Protection, Rear Racks, and more. Ready for street adventures. With the updated version of Triumph’s revised Street Scrambler, your setup for any road with Hepco & Becker’s great range of gear. We offer single sided (left) C-Bow luggage mounts for Scrambler plus Crash protection, Rear Racks, Top Cases, Skid Plate (sump guard) and mre. Ready for all road adventures. For more news (or older news) Please check out our (English) news page in Germany!